For quality service, FREE measurements, FREE, no obligation estimates, and FREE delivery, contact Braun Building Center today! 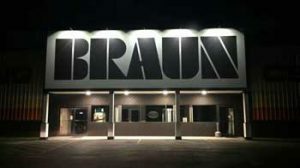 Braun Building Center officially began back in 1968 when patriarch Bob Braun purchased Laird Lumber Company on Chicago Street in Manitowoc and changed the name to Braun Building Center. 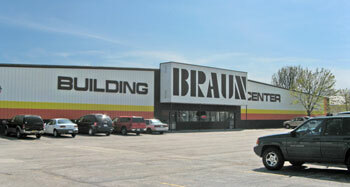 In 1978, Bob and Carlie Braun built Braun’s current building located at 3303 Menasha Avenue. The new property location allowed them to open one of the early “Home Centers” that became the area’s model for current “Big Box” stores. In 1989, Paul and Dana Braun took over the helm and began the next generation in the lumber business. Over the years with the advent of the “Big Box” retailers, Braun Building Center has evolved into becoming a “Pro Dealer” – meaning that our primary customer is the professional builder who buys materials to be used on a project for someone else. We also cater to the do-it-yourselfer and area homeowner looking for kitchen design/remodeling and Residential/Home design – services that set us apart from the rest. Our professional designers have guided countless homeowners through the design process. In addition to a large inventory of lumber and plywoods, Braun also manufacturers wood roof trusses, stocks a large inventory of roofing, siding, drywall, steel studs, and insulation.